Have you ever thought making cheese or yogurt was a complicated process requiring a lot of fancy equipment, hands-on time, and a big mess? It's not! To make fresh cheeses, you need to acquire a few specialized items and you will be ready to go with just a fresh gallon of milk. Making cheese is a simple two-step process. In the first step milk is gently heated to a given temperature and maintained at that temperature for a given amount of time. It is then cooled as quickly as possible in an ice bath to the temperature specified in the recipe. Once cooled, during the second step, the milk can be made into either mozzarella or ricotta cheese by forming curds and whey, then separating and shaping the curds. Yogurt, the most popular fermented milk in the world, can be made with any type of milk by heating the it, adding yogurt starter, and then allowing the milk to incubate for 6-8 hours. Easy! Would you like to learn more? It's time for another fun, informative, and useful Saturday Food Preservation Class taught by your local UC Master Food Preservers! Please join us for a two-hour class on making the most of your local dairy milk. Our Master Food Preservers will demonstrate how to transform milk several different ways into delicious staples you can make instead of buy. 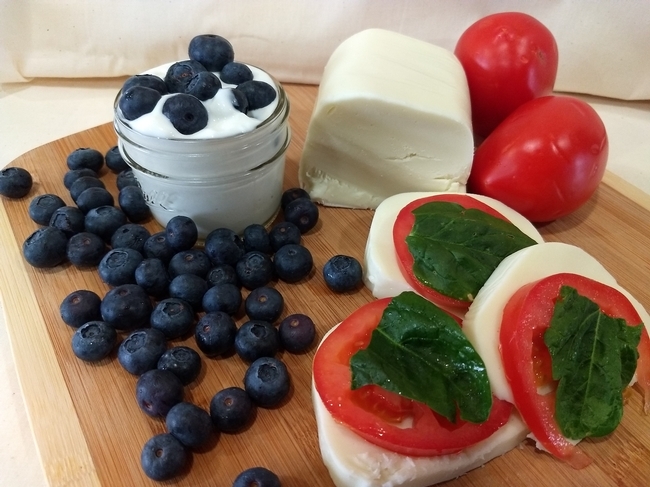 The class will provide an overview of making soft cheeses and yogurt at home with a focus on food safety. Demonstrations will include how to make delicious, creamy yogurt in an electric pressure cooker or using other common household equipment, how to make fresh homemade butter, ways to make use of the leftover whey and buttermilk, and making fresh ricotta and mozzarella cheese in your own home. Instruction will be followed by a question and answer session so you will leave feeling confident and ready to recreate the recipes in your kitchen. The class will be held Saturday, March 23rd from 10am-12pm in the UCCE Auditorium, 2156 Sierra Way, San Luis Obispo. The registration fee is $20 which includes some supplies to get you started and tested techniques with recipes. Register at http://ucanr.edu/yogurtandcheesemaking. Pre-registration required. Hi Patricia. Unfortunately, I believe the class is full. For more information, you can contact the program at slomfp@ucanr.edu, or 805-781-1429.